We get all our free-range eggs, which is more than 150 each week, for the dishes we create from John and Mandy Widdowson from Exe Valley Eggs near Stoodleigh, Tiverton. We’ve been sourcing our eggs from the couple for more than 10 years now and they provide a fantastic, tasty product combined with a great service. This family-run farm allows its hens to roam freely during the day in fields above the Exe Valley and the farm is inspected to RSPCA welfare standards by the organisation’s independently certified farm assurance scheme. The business was established more than 25-years-ago as a partnership between John and Mandy and John’s in-laws Brian and Gay Grimston. The entire family, including the Widdowson daughters Nicola and Lucy, have played their part in the life of the farm, but John, with the backing of a dedicated workforce, now has day-to-day responsibility. John says: “We were one of the first farms to recognise the benefits of providing hens with overhead outdoor cover, which gives them the confidence to range more freely. This provides them not only a healthier lifestyle, but a chance to enrich their diet from natural pasture. 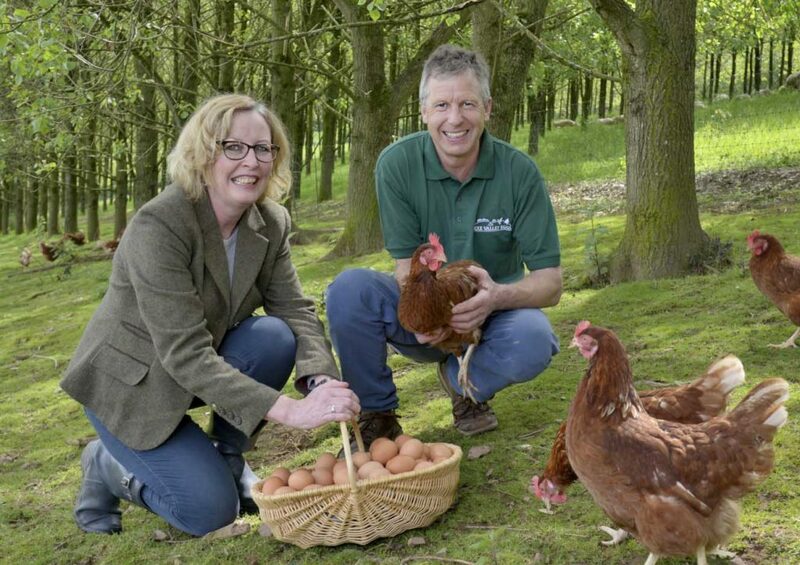 “We initially planted more than 5,000 trees and the immediate success of our project was such that it led to the creation of a specific brand of Woodland Eggs now sold by a major supermarket. We strive to champion local producers here at The Swan and we’re keen to let you know where your food comes from and that you’re supporting the areas’ farmers when you eat with us.